TONIGHT Benedict Cumberbatch & Tom Hiddleston in Spielberg’s WAR HORSE (cert 12A under 16s welcome) at Langley Boys’ WW1 Centenary festival – all welcome. Tickets £8/£5. Bar opens 6.40pm and film starts 7.30pm. Come and see the School’s WW1 museum, full of local stories and artefacts – open 45mins before each evening event. TONIGHT see Spielberg’s WAR HORSE (cert 12A under 16s welcome) at Langley Boys’ WW1 Centenary festival – all welcome. See Spielberg’s WAR HORSE (cert 12A under 16s welcome) on Thurs 26/6/14 at Langley Boys’ WW1 Centenary festival – all welcome. TONIGHT! TUE 17 JUNE – A STORY OF CHILDREN AND FILM an enchanting documentary by Mark Cousins, one of our most personal and creative film-makers/critics. FREE parking – friendly licensed bar opens 6.40pm, film programme starts at 7.30pm. At Langley Park School for Boys, Beckenham, SE London/Kent – everyone very welcome. The Opening Gala of our WW1 Centenary festival on Mon 16 June 7.30pm is FREE to everyone in the local community. An evening of talented students in commemoration of the WW1 Centenary remembering the Langley boys of 1914 who went to war – in song, music, dance and poetry with a brand new documentary short and two short historical presentations about why the Great War still matters. Please spread the word, come and join us in the magnificent Bromley Hall and get a taste of Langley Park School for Boys. Also visit our ‘pop-up’ museum of WW1 artefacts and archives open at 6.45pm tomorrow. This event will be attended by the new Mayor, Councillor Julian Benington. The Opening Gala of our WW1 Centenary festival on Mon 16 June 7.30pm is FREE to all in the local community. An evening of talented students in commemoration of the WW1 Centenary – in song, music, dance and poetry with a brand new documentary short and two short historical presentations about why the Great War still matters. Also visit our ‘pop-up’ museum of WW1 artefacts and archives. This event will be attended by the new Mayor, Councillor Julian Benington. Come to Langley Park Boys Beckenham for our 3-week WW1 Centenary Commemorative Arts Festival 16 June to 6 July. Open to all the community! See some of our key festival events below. We have so much going on in June and July to mark the WW1 centenary and we hope you’ll join us, as a member of our local Beckenham & Bromley community, for a range of events and spectacular displays! All of these events are open to the local community. Including 600 beautiful poppies made by 600 pupils and a reconstruction of a WW1 battlefield trench. 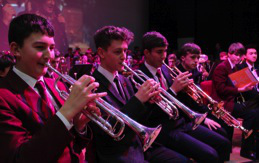 – An Opening Gala event in the magnificent Performance Hall on Monday 16 June, to be attended by the new Mayor, Cllr Julian Benington, & Mayoress of Bromley, of music, poetry and dance with presentations about why WW1 still matters, with a screening of a short film about pupils’ visit to the battlefields in February. Retiring collection for The Royal British Legion. – A FREE political cartoon workshop on Sat 21 June 2-5pm – a ‘hands-on’ activity for all the family, plus learn about how cartoons were and are used as propaganda – refreshments & home-made cakes available (no need to book, just turn up). – A FREE screening of ‘Paths of Glory’ (PG), Stanley Kubrick’s acclaimed film about WW1 starring Kirk Douglas in one of his finest performances – tickets going fast! Under 16s welcome. – A Bandstand Live outdoor performance by our outstanding young musicians and Bar-B-Q on Friday 20 June! – A guest performance by The Matchbox Theatre of West Wickham on 25 June! – Steven Spielberg’s spectacular ‘War Horse’ on 26 June on our BIG screen – Under 16s very welcome. £8/5. – Finishing on Sunday 6 July with a spectacular performance (2 at 3pm and 6pm) of Karl Jenkins’ The Armed Man: A Mass for Peace by LPSB Community Choir, BYMT Adult Choir (over 200 singers) and BYMT Sinfonia. Retiring collection for Help for Heroes.